"Sometimes I burn down greenhouses." 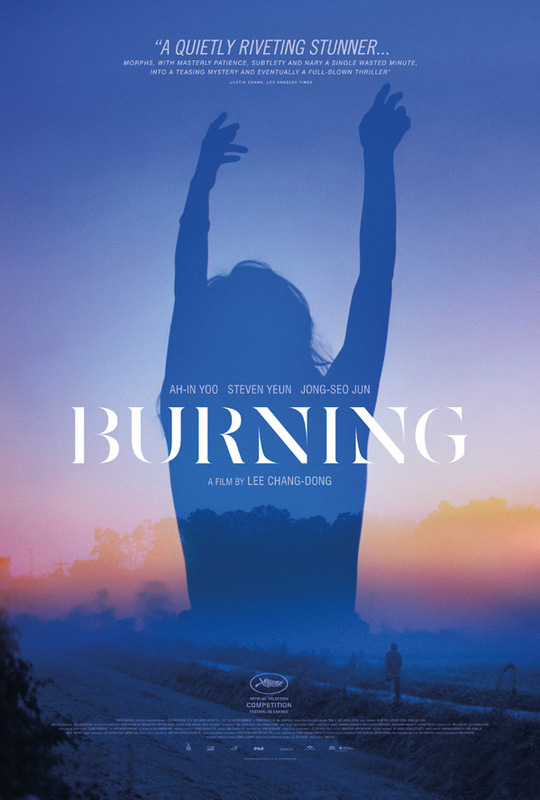 Well Go USA has released the full-length official US trailer for the Korean film Burning, which premiered at the Cannes Film Festival earlier this year to rave reviews (and the FIPRESCI Prize). It played at the Karlovy Vary Film Festival, and is stopping at the Toronto, New York, & London Film Festivals. South Korea also just submitted the film to the Oscars this year. Based on a short story by Haruki Murakami, this slow burn dramatic thriller is about a boy who meets a young woman, but things start to get weird when another Korean man appears out of nowhere and starts spending time with her as well. Ah-In Yoo stars as Jong-su, along with Jong-seo Jun, Kim Soo-Kyung, plus Steven Yuen in a very intriguing role. This is a very slick trailer, a very compelling way to draw you into the mystery and curiosity of the film's story. If this doesn't sell you, nothing will. But hopefully it does sell you. Watch below. You can still watch the original teaser trailer for Lee Chang-dong's Burning here, to see a bit more. Burning is the searing examination of an alienated young man, Jongsu (Ah-in Yoo), a frustrated introvert whose already difficult life is complicated by the appearance of two people into his orbit: first, Haemi (newcomer Jong-seo Jun), a spirited woman who offers romantic possibility, and then, Ben (Steven Yeun), a wealthy and sophisticated man she returns from a trip with. When Jongsu learns of Ben's mysterious hobby and Haemi suddenly disappears, his confusion and obsessions begin to mount, culminating in a stunning finale. Burning is directed by acclaimed Korean filmmaker Lee Chang-dong, of the films Green Fish, Peppermint Candy, Oasis, Secret Sunshine, and Poetry previously. The screenplay is written by Jung-mi Oh Lee Chang-dong, based on the short story "Barn Burning" by Haruki Murakami. This first premiered at the Cannes Film Festival earlier this year, and has been playing at other festivals ever since. Well Go USA will release Lee Chang-dong's Burning in select US theaters starting on October 26th this fall. Interested?